How do I strike a balance between time spent living and time spent documenting? For example, when traveling, my anxiety about documenting rises. Should I sit and write what I did yesterday or should I go do something today? Is it enough to find a park bench in Paris where I can write and, when pausing to think, glance up to watch tots at the edge of a pond floating their wooden sailboats? If I miss a few days of journal-keeping on a holiday, there accumulates a brain-boggling backlog to record; instead of the satisfying documenting of charming details, I end up making a list: biked in park, roamed vegetable market, roast fish for dinner. Unsatisfying, not the fish, but the list. 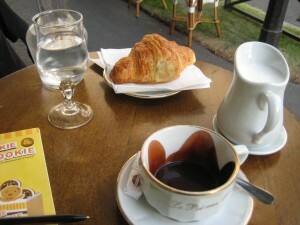 It occurs to me now that relating my adventures on the page are part of the travel experience. 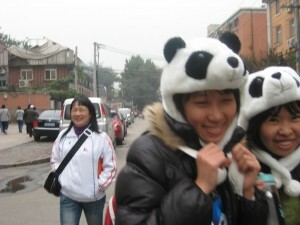 And though I’m mainly drawn to elaborating on what I see–giggly Chinese girls in panda hats–in the future I’ll strive for more reflection. That said, I gave up my daily journal writing years ago, due to generating too many ideas. The more I write, the more ideas spring up, ideas to paint a huge wooden CURB YOUR DOG sign with a stake to drive into my front lawn, ideas for a come as you are potluck party, ideas to volunteer Casey as a therapy dog (which we did until he got anxious and pooped on a rug amid a ring of senior citizens). And then there was the idea to print out my essays and sell them for a dollar a piece at rush hour. Getting photographed at the Dupont Circle subway station for the front page of the Metro section–with my stack of essays on a bridge table–accompanied the fantasy. I struggled to narrow down the journal-generated list but that resulted in accomplishing nothing. Plus, working at home, writing essays about myself, I was already hanging out in my own head to excess, so I gave up the journal. Then there are all the photographs. Yipes. See my upcoming post, Documenting My Life, Part II, The Photographs. I’d love to hear how you document your life. 3 Responses to "DOCUMENTING MY LIFE, PART I, THE JOURNAL"